Get Flat 40% – 80% Off On Clothing, Footwear & Accessories Displayed On The Offer Page. Offer Valid On Top Fashion Brands Like Adidas, Reebok, Ray Ban, Benetton, Levis, Puma and Many More. No Coupon Code Required to Avail This Offer. Offer Valid For Limited Period..
Now Get Upto 50% Off On Home & Kitchen’s Appliances Displayed on the Offer Page. Offer Valid On Top Brands Such As Wonderchef, Philips, Pigeon, Kent & Many More Brands. No Coupon Code Required To Avail This Offer. 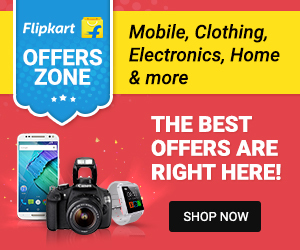 Get here all verified Flipkart Coupons, Discount codes, Vouchers Codes, Flipkart Offers and promotion codes from Couponkaro can help you to start Saving Money on Mobiles, Electronics, fashion, Clothing, Laptops, Home & Kitchen appliances during online shopping.